The autumnal weather that we experienced towards the end of August, helped the fishing no end and as a result the fish are up in the water once more and the fry bashing is in full swing. Fly patterns such as cats whiskers, zonkers, sparklers and floating fry are all working well at present in combination with a sinking line approach. Evenings have been best for surface activity, with both buzzer and sedges coming off the water. Daddies and hoppers have been scoring well too! Hawkshead Angling Club member Neville Jameson took to the boats and landed 3 brownies. Neville employed an intermediate line and damsel nymph approach up in the North basin. Meanwhile Alex Fenton from Fife up in Scotland managed a nice brace of browns, one on a silver Invicta and the other on a pearly pennel from the boats and again up in the North basin along the boathouse banking. Any method anglers have been reporting some really good days too. 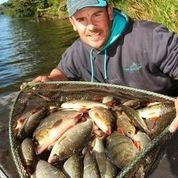 Nathan Poland from Workington used spinning tactics from the boats and landed 8 brownies! Michael Brody from Southport also had 3 trout using float fished worm, again from the boats. Our Pike season starts proper on the 1st October with permitted methods to include deadbaits, lures and fly. As well as day tickets, don’t forget we offer season tickets for the winter Pike fishing too. Please contact Dave or Alex on 015394 36541. Alternatively please visit our website www.hawksheadtrout.com for all the information you need. To all you competition fly angler’s out there, we will be running a one off pairs competition on Sunday 28th September. If anyone would like to fish the competition or knows someone who might, then please get in touch to book your boat, there are still a few available. There are some fantastic prizes up for grabs!